On May 16, 2015 I manually gathered APC and currency information for the 388 journals in DOAJ added after March 2014 that have publication fees, using a DOAJ Advanced Search / limit by journal then Article Processing Charges / Yes. The data for this subset has been posted in the OA APC dataverse (file name DOAJ Accepted after 2014 has charges). Some preliminary observations follow. Last year we found about 6% of journals actually had per-page rather than per-article charges; this model is not represented in DOAJ at all. This model has some logic to it, so this may be an unfortunate side-effect of the new DOAJ form and application process. 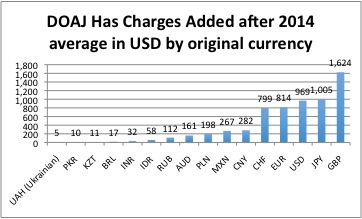 The average APC in USD varies quite a bit by original currency, with journals charging in Great Britain Pounds (GBP) charging double journals charging in Euros. Could UK funders’ enthusiasm for paying APCs be a factor? The difference in APC by currency can help to explain the advantages of local publishing; it makes sense for an Indian scholar to pay an average equivalent of $32 USD rather than about 30 times this amount, the average for journals charging in USD. While the average APC of this subset is lower than we found last year, there are more journals at the top of the price range; 5 journals over the $4,000 mark as compared with only 1 from our sample last year. While the average APC in USD of this subset is lower than the average we found in 2014 ($933 vs. $964), the data seems to suggest several different tendencies happening at the same time. Last year we found that about 6% of journals actually used a per-page rather than per-article cost. There is no way for journals to indicate this model today. This means that journals using this model either cannot participate in the DOAJ re-application process, or have to change their model. There is some logic to page charges as at least some of the costs of publishing (e.g. copyediting and proofreading) will vary depending on the length of the article. It would be unfortunate to drop this model simply because of the central importance of DOAJ for open access journals and the desire for simplicity in filling out the form. The average may be lower, but there are more journals at the top of the price range. In 2014, of the 1,326 journals we looked at that had an APC, only one journal sampled had an APC of over $4000; only 6 had APCs of $3000 or higher. This May, out of a much smaller sample of 388 journals, 5 journals charge more than $4,000 and 10 have APCs of $3,000 or higher. The average price in USD varies quite a bit by currency. The average price for journals charging in Great Britain Pounds (GBP) is double the amount for journals charging in Euros and 68% higher than journals charging in USD. Could the UK’s enthusiasm for paying APCs be a factor? 16 currencies are represented in this sub-sample, however 3 currencies dominate. 61% of these journals charge in USD, 21% in Euros and 9% in GBP, accounting for more than 90% of the total. Looking at the average amounts by currency may help to explain the advantages of local publishing. If you’re in India it’s probably a lot easier to come up with an average APC of 1,500 Indian rupees, the equivalent of $32 USD, rather than the average $969 of journals that charge in USD, roughly 30 times the amount. 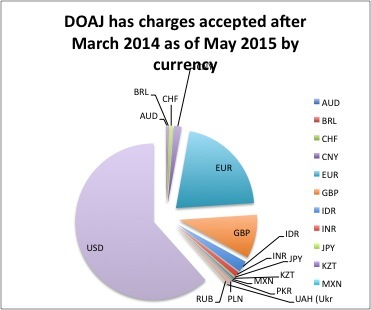 Method note: currency conversions were done using the Bank of Canada daily currency converter on May 17, 2015, in addition to the Central Banks of Khazakistan and the Ukraine (thanks to Wikipedia for the pointer to where to find this information). The Bank of Canada calculations can be verified at a later date using their 10-year currency converter. We may have more on this subset at a later date after the data is entered into the main spreadsheet with other DOAJ metadata and compared with our publisher website checks.